It is actually a fairly common problem, especially in newer energy efficient homes. That might seem strange but it’s true. Energy efficient homes are more air tight than ever before to keep temperature controlled air inside thus lowering your heating and cooling costs. The problem is that cooking and showering etc increase the amount of moisture in your home. If not monitored and dealt with the excess moisture can lead to mold. But I bought vinyl windows to avoid all that. Vinyl windows aren’t a source of food (unlike wood framed windows) and don’t by themselves promote mold growth. But mold will grow on any damp organic matter. Dust and dirt have organic matter. So if your window sills accumulate dust and get damp from condensation etc. they can support mold. So in addition to addressing the moisture content in your home you need to keep your window sills free of dust. So how do I keep my home’s moisture content down? When cooking or showering use a vent fan to push the damp air outside. If you have heavy window covering like plantation shutters damp moist air can get trapped between the shutter and the window. You should open them regularly or keep them cracked so the air between them and the window so any moisture the trapped air can escape. This is especially true if you see condensation on your windows. If you have severe problems with moisture you can even use a dehumidifier. Vinyl windows are a great value. If you have any issues with your current windows or you are interested in replacing them. Don’t hesitate to contact K-Designers at 800-728-3902 or www.k-designers.com. A homes curb appeal is based completely on the exterior of your home. The front yard, the driveway, the front door, the windows and the exterior walls of your home all play a part in how your home is judged. And it is judged. That’s what people do when they see your home. They make snap decisions on its appearance. They may never visit the interior but they will have an opinion on the value of your home and you the owner. You may or may not care how others view your home now, but if you intend to sell your home at some point. It’s vitally important. For some time now wooden exteriors have been the most common sort of siding material. Wood is familiar, time tested and versatile. But, as of the 2010 census, wood is no longer king. Vinyl has taken over as the most chosen siding for remodeling projects and for new home construction. With the advances manufacturers have made in quality and style, it’s no surprise. Vinyl manufacturers have expanded their product lines to include a wide variety of board styles and color options. This is especially important if working on a historical restoration where you need to match specific board widths or colors for a particular time period. In addition to all the verities your base vinyl can come in there are a number of enhancing elements that can customize your install. Shutters, window wraps, keystones, headers, pillars etc. All of these elements can be added to your base vinyl install to make your house fit in with others in the neighborhood or to truly stand out. No two siding installs need look the same. 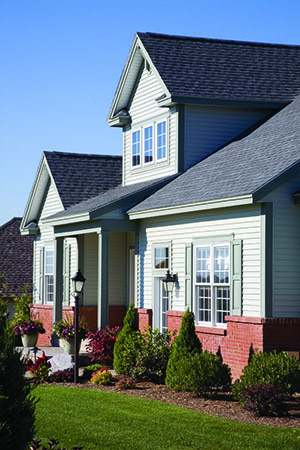 If you are looking for a quick boost to your homes curb appeal consider vinyl siding. Call K-Designers 800-728-3902 to talk to one of our knowledgeable representatives to learn just how versatile vinyl can be, or you can visit us online at www.k-designers.com. Weather can change your living habits from season to season. But you can do a few things to blunt the weather’s effects on your enjoyment of the outdoors. Most enjoy spending time outside on a deck or patio but when the snow or rain start falling it’s time to move indoors. Instead of moving indoors immediately you might consider a few products that can extend your outdoor living. Solid patio covers like America’s Dream Koolshade are ideal. They block the sun in the summer and keep the snow and rain off in the winter. If you add a heat source you could use your patio months longer. Underdeck systems like Ultimate Underdeck are relatively uncommon but are similar to a solid patio roof. Underdeck systems are hung under an existing raised deck. They catch rain and snow and guide it away. This creates an attractive ceiling you could hang lights from and a new dry area below for furniture. As with the solid patio cover if you add a heat source you could probably use the area under your deck for months longer. If any of these products are of interest or if you have some other remodeling project in mind don’t hesitate to call 800-728-3902 or visit us at www.k-designers.com. It might seem odd but even small changes can make a huge impact on how you feel about your home. A home that is tired, rundown, outdated, and overgrown can be saved and make you feel like you’ve just moved in. First impressions are important. What the exterior of your home and its landscaping say make an impact that is hard to shake. Remember that old saying “don’t buy a book by its cover” It’s still around because that is exactly what people do. They buy for looks over content. 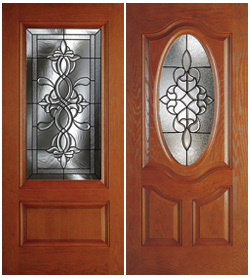 Updating your landscape, entry door, garage door, siding, windows, lighting etc. will give your home positive impact. Add a structure to your home that gives you shade and protection from the elements to increase your useable living space. A patio cover can become an extra living room, dining room or kitchen. Raised decks are another opportunity to create an exterior living space. Put in an under deck ceiling system. The system is attached to the underside of your deck and is designed to divert the rain into gutters thus making the area under your deck dry despite the weather. A simple renovation and you increase the usable square footage of your home. Maintenance on a home is inevitable but you can reduce that by using well designed or updated products. 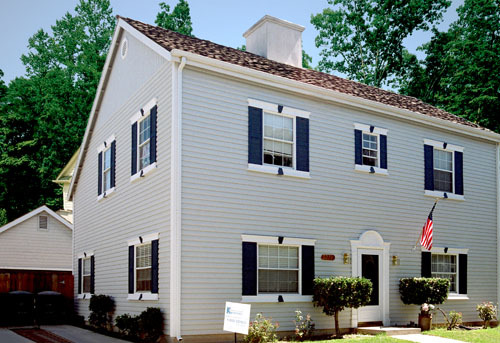 Vinyl siding needs little in the way of maintenance and never needs to be painted. Swapping out old and leaking windows and doors can save you future repairs that these leaks can cause over time. Installing leaf gutter guards on your gutters mean you won’t have to clean them out every year. Leaving you more time to enjoy your home and not work on it. A well maintained and lit exterior will deter thieves. Overgrown plants and poorly lit landscapes allow areas for thieves to hide their activities making your home an easier target. Installing motion sensitive lighting can also deter criminals, make it easier to get around at night and save on your electric bill. Replacing old outdated windows can save you money on both heating and cooling. Most replacement windows have a variety of energy conservation features. Double or triple pane windows with dense gasses inserted between the panes of glass that slow heat and cold loss or gain. Some even have reflective or filtering film laminated to the glass to keep out the harsh summer sun. 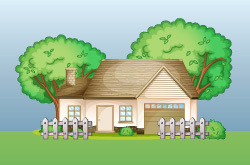 Planting shade trees and plants around your home can reap rewards in your summer cooling bill. Many areas even have deals where you can get shade trees for no cost. If you are out caring for you home you are more likely to interact with your neighbors. Having a well maintained exterior will inspire (or shame) others in your neighborhood to maintain or improve their own home’s appearance. It spreads a sense of pride in the neighborhood. If you sell your home the houses around yours affect how much you will get and how fast it sells. Don’t be the one to say “Why did I wait so long?” Give K-Designers a call 800-728-3902 or visit us online www.k-designers.com and get your remodeling project off the ground. Summer has arrived and the unrelenting heat of the summer sun can make a big impact on the cost of keeping your home comfortable. So what can you do? 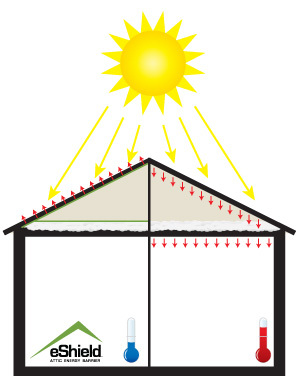 Direct sunlight on your home is the primary reason your homes temperature rises. Planting shade trees will certainly affect this but you will have to wait a few years for them to grow. So if you want relief now what can you do? Insulation is the answer. We aren’t talking standard insulation. After all, you already have that. What you need is insulation formulated to block radiant heat. Radiant heat is one of three types of heat energy which can warm your home. It is the heat energy given off by an objects in the form of infrared radiation. An example of this would be a campfire. The burning material radiates heat out in a sphere. Any warm object that you can feel the heat from without touching is sending out radiant heat. It’s important to block this form of heat because it represents the largest heat gain for your home. The sun rains down on your home radiant heat. This warms up your roof and then is in turn radiated from your roof to the insulation and other materials of your ceiling. (Standard insulation does not reflect heat or cold. It’s function is to slow down the transfer of heat or cold through itself. So while it does this well and better the more of it there is the heat or cold will eventually pass through this material.) From there it will enter into and heat up your living space causing you to spend money maintaining a comfortable temperature. Radiant heat blocking or reflecting insulations like Eshield 11000 can block as much as 97% of the radiant energy hitting it. It is a thin silvery material installed on the underside of your roof decreasing heat gain and installed on the floor of your attic to prevent heat loss. Installations have been known to decrease an attic’s summer temp by as much as 40 degrees. If you are interested in lowering your energy bill give K-Designers a call 800-728-3902 for your free quote or visit us online at www.k-designers.com. It’s not uncommon to let home repairs or improvements slide because you just don’t want to deal with the hassle. It’s surprising how much you can deal with if it just creeps up on you. Take for instance your bathroom. It is an excellent place to spend money on your home. The dollars spent here will return if you sell your home. They are also very utilized areas and a change here will increase the enjoyment of your home. So why don’t we remodel? It’s not that bad, it’s too much money, I don’t have time to deal with it, I can’t do without the bathroom for the time of the remodel. These are all just excuses. Projects can be financed and with a little planning the inconvenience can be minimized. 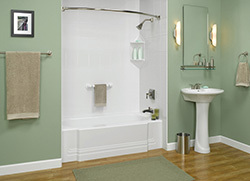 K-Designers has some bathroom remodeling packages that can be installed in a day. When the project is finished you will wonder why you waited. When you are ready K-Designers can help with your bathroom remodels or with many other remodeling projects you might have around the house. Give us a call at 800-728-3902 or visit us online at www.k-designers.com. Putting money into your home is rarely a bad idea. Whether you plan on keeping your home for a long time or you just want to improve it a little and sell there are several projects that can add value to your investment. Improve your landscaping: It’s all about curb appeal. The landscaping is a major part of your homes curb appeal. We make snap decisions based on what we see from the curb. Spruce up the yard to get a better first impression. As we all know first impression’s are hard to shake, so make it a good one. Exterior: Again it’s all about curb appeal. What people see from the outside. Landscaping is a part of that but not all. Any area visible to visitors is a prime area for improvement. Walls, terraces, windows, doors, decks etc. Complete replacement or even something as simple as a new coat of paint. Interior: Walls, Ceilings and floors. These areas are big and obvious to visitors. If you plan on replacing or changing the surfaces then use quality materials especially if you wish to sell. Specific areas: Kitchen’s, bathroom’s, and basements rank very high in regards to return on your investment. When doing a remodel always keep in mind your return on investment. Sometimes that return is money when you sell the home, and sometimes it’s just quality of life enjoying your home. Always use quality materials but keep in mind that you may not get back all you invest if your upgrades exceed the neighborhood market value for your home. When you are ready to start that home remodeling project K-designers can help. We offer a variety of remodeling packages for you home. Give us a call at 800-728-3902 or visit us online at www.k-designers.com.